Would you like be our supplier or are you already one? Here you can see our product range and who to contact. Current Gekås Ullared suppliers just only have to log in to find any relevant instructions but also tips before visiting us. 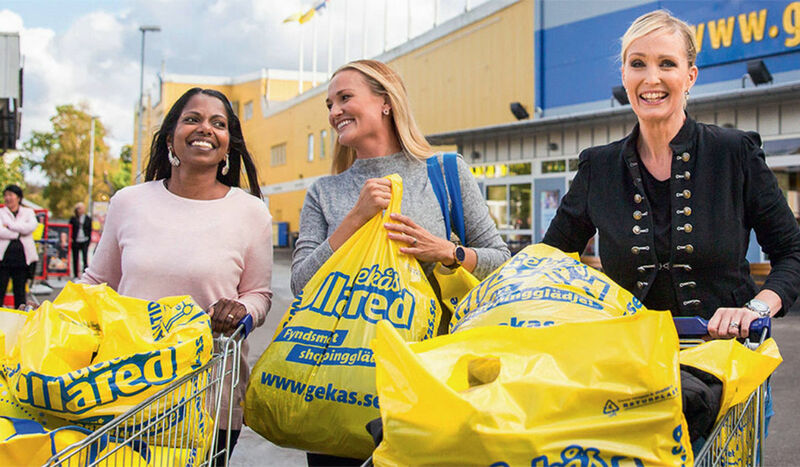 Scandinavia’s largest superstore, Gekås Ullared, is located 100 km from Gothenburg and 200 km from Malmö. The superstore, which has a surface area of 35,000 m², sells “everything for the home that will fit in a car”. Our largest product group is womenswear, kidswear and menswear. We also sell bags, home textiles, home furnishings, kitchen utensils, lighting, cleaning products, body care products, cosmetics, toys, baby accessories, consumer electronics, media, horse and pet supplies, tools, leisure items and food. In 2015, our turnover was SEK 5.2 billion. Since the company was set up in 1963, we have increased our turnover every year. Gekås Ullared has no debts and all investments are paid for from the profits made by the company. For many years the company has been rated AAA by Dun & Bradstreet Soliditet AB. A good sense of achievement for us and security for you as a supplier. Gekås Ullared is not listed on the stock exchange and there are no plans to do so in the future. Our purchasing department here at Gekås Ullared manages the majority of purchases from the office in Ullared. The company has some 20 full-time buyers and ten purchasing assistants who work in different teams. Each team comprises of one or more buyers who are responsible for specific product groups, and assistants who work with the buyers in the team. Only a small part of our range is purchased in batches. The majority of our offering is purchased through standard channels. We buy through agents and importers and through direct contact with suppliers.